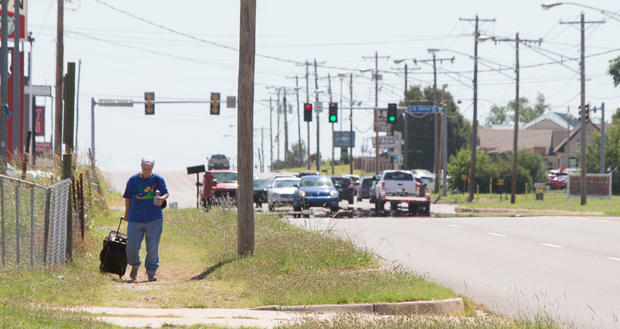 A woman pulls a suitcase along NE 23rd Street near N. Spencer Road in Oklahoma City. Oklahoma City residents’ life expectancies vary greatly across the city. Among all ZIP codes, the difference between the highest life expectancy and the lowest is 18 years. According to the Oklahoma City-County Health Department’s new wellness report, residents in the 73131 ZIP code have a life expectancy of 82 years, while their neighbors in the next door 73141 ZIP code live for an average of less than 68 years - a similar expectancy as developing countries such as Cambodia and Iraq. Journal Record reporter Sarah Terry-Cobo writes the 73141 ZIP code has fewer than 5,000 residents and among the worst health outcomes in the city. People there were among those with the highest rates of respiratory disease, heart disease death rates, heart attack death rates, diabetes death rates and high-blood-pressure death rates. Nineteen percent live within 1 mile of a supermarket. Median household income is slightly more than $37,000 and 42 percent of people there work full time, according to U.S. Census Bureau data. Terry-Cobo told KGOU there are few things that promote a healthy lifestyle in the poorer ZIP code. “There’s not many sidewalks or clinics. And nearby in that healthier ZIP code, the 73131, it’s more of a planned communities. That means more parks and sidewalks, but also more places to get healthy food,” Terry-Cobo said during this week’s Business Intelligence Report. Neighborhoods with good health and long life expectancies tend to be planned communities that have sidewalks, parks and places to exercise. Residents tend to have more education. OCCHD epidemiology administrator Megan Holderness said the way a neighborhood is built can affect its residents’ health. But it takes more than infrastructure to help out those areas with unhealthy residents. Building new hospitals in the 73141 and other unhealthy ZIP codes won’t necessarily solve the problem, Holderness said. McCleland: Sarah, you wrote about two Oklahoma City ZIP codes that have very different health outcomes - 73131 and 73141. The ZIP codes are so close to each other, but people in one ZIP code have a life expectancy of 82 years, and those in the other average 68 years. 73141 is the area where people don’t live as long. What’s going on there? Terry Cobo: That ZIP code has some of the highest death rates from things like heart disease, heart attacks, diabetes and high blood pressure. There’s also a high rate of respiratory disease. There’s also high poverty and low educational attainment. McCleland: A life expectancy of 68 year, by the way, that’s by comparison, by the way, similar to Iraq and Cambodia. What can drive one neighborhood to have a life expectancy similar to that of a developing country, and one next door that’s above the national average? Terry Cobo: It’s a really interesting dichotomy, right Jacob? There’s not a lot that promotes health there in that sick ZIP code, either. There’s not many sidewalks or clinics. And nearby in that healthier ZIP code, the 73131, it’s more of a planned communities. That means more parks and sidewalks, but also more places to get healthy food. McCleland: In that sicker neighborhood, are there places to get healthy food nearby? Terry Cobo: Well, Jacob, that’s the thing. I could only find one grocery store, and that was on the southernmost edge of the ZIP code. We didn’t even find that many convenience stores. And only 20 percent of the people live within a one mile walk to a supermarket. But we did see a pickup truck and trailer with a person selling watermelons and cantaloupes. But that’s seasonal, of course. McCleland: What are some of the strategies to help improve health in Oklahoma City’s less healthy neighborhood? Terry Cobo: Well, education is a big part of it. So now the Oklahoma City-County Health Department knows which people need the most help, they will partner with non-profit groups to hire community health workers. Those workers will meet with people who use emergency department in the place of a family physician, for example, and they will teach them about community clinics. Those workers can also provide education on how to buy and how to cook healthy food. McCleland: Sarah, I want to talk for a little while about another article that you wrote in your paper this week. Oklahoma City earned a certification from SolSmart for the city’s solar development. But Oklahoma City really doesn’t produce a whole lot of solar power. Why did the city earn this certification? McCleland: What are the benefits of attaining this bronze certification? Terry Cobo: The designation is fairly symbolic, but those in the renewable energy community say it’s an important step to continuing the conversation. Really they want to normalize solar as an important resource. McCleland: Oklahoma has a lot of potential to produce a lot of solar power, but it really isn’t happening. What’s holding Oklahoma back? Terry Cobo: The biggest thing really is low electricity prices. We have some of the lowest electricity rates in the nation. There is also high costs to add a solar system once a home or business has been built, which means there is a really long payback time. That’ in the range of like 15 to 25 years. McCleland: How do Oklahoma regulations play into this mix? Terr Cobo: It’s complicated, but in part if you produce more solar energy than you use in your home or business, you’re basically donating it to the utility. They don’t have to pay you for any excess electricity that you produce. Some in the solar industry have tried unsuccessfully thus far to change those rules. There's more grim news about inequality in America. 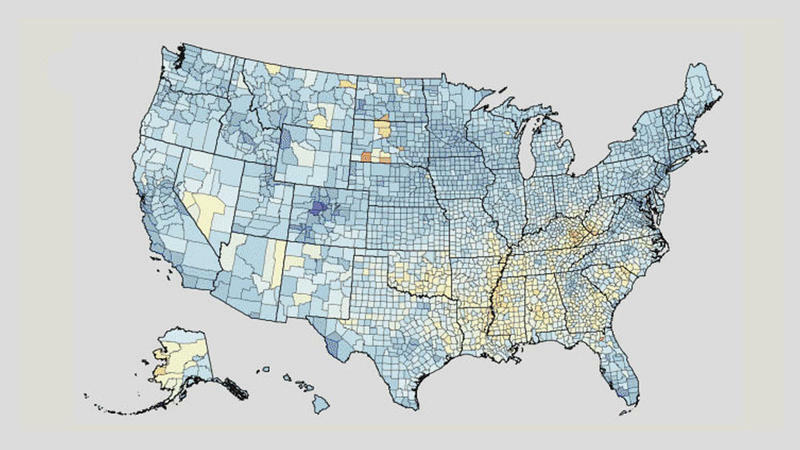 New research documents significant disparities in the life spans of Americans depending on where they live. And those gaps appear to be widening, according to the research.